On our last report we spoke about the much awaited cold (cooler) fronts and how the anticipated upswing for offshore Fort Lauderdale fishing really didn’t turn many heads or really last very long to boot. Slow tough days on the water and an occasional nice catch. And then there are the good days. Memorable days, which keep us all coming back. 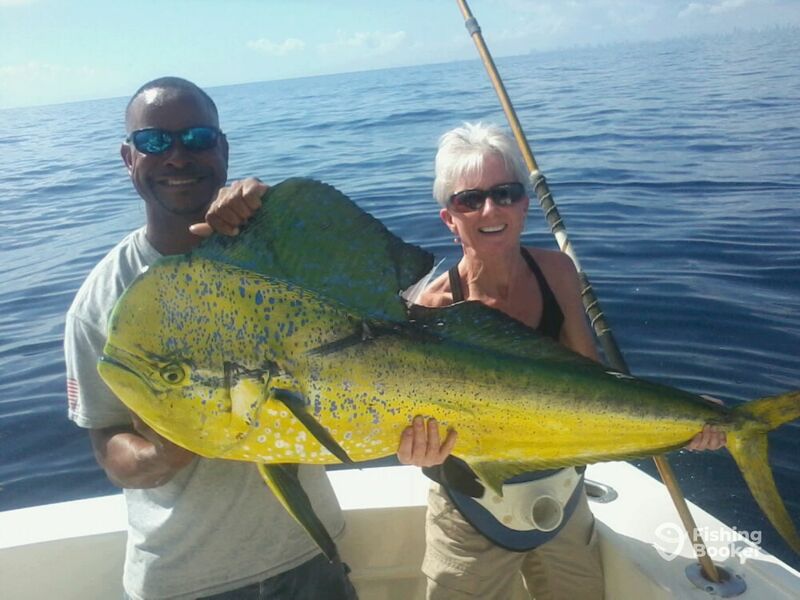 Pictured is Karen and 1st mate Big Dave with a killer Mahi-Mahi aboard the Marlin My Darlin. This fish took a live Pilchard cast especially for him on an offshore edge in 860 feet of water. He turned down two previous casts with a good frisky bait as frustration mounted on our end. A third cast with a brand new bait with a slightly different hook placement got the green light we hoped for. That is a real nice Mahi on 20 pound spin and she did a great job with a large and difficult fish. We had 6 or 7 more keepers and 3 or 4 of them took some coaxing as well. Two Wahoo and a nice fat Skippy rounded out the trip. Lots of people ask me when is a good time to go fishing and always my initial reply is “any time you can”. I say that and then I’ll get more specific about my favorite months, etc. But it’s true you know. Every day is different and has the potential to be special. Get out there. We closed our last report lamenting the erratic offshore fishing and that we were looking forward to a new day “tomorrow”. Sometimes tomorrow is another tough day. Sometimes it isn’t. “Any time you can”.